In this post you’ll learn the most common Brazilian Portuguese expressions with papo. Papo means crop, pouch, craw: the part of the throat in many birds where food is stored before going into the stomach. Ontem saí com a minha amiga pra bater um papo. Yesterday I went out with my friend to have a chat. Ficamos horas batendo um papo com a Maria. We spent hours chatting to Maria. Eu gosto de conversar com o Marcelo. Ele é bom de papo. I like talking to Marcelo. He’s good at chatting. It can be used an expression or as an adjective to describe someone who likes intellectual chats. Often used in the pejorative sense. Não gosto de conversar com o Carlos. Ele sempre vem com papo-cabeça. I don’t like talking to Carlos. He always comes with that ‘intellectual talk’ of his. O Carlos é muito papo-cabeça pro meu gosto. Carlos is too much of an intellectual to my taste. Promessa de político é sempre papo-furado. A politician’s pledge is always idle talk. Não confie nele, ele é um papo-furado. Don’t trust him, he is a “papo furado” (he always talks rubbish). O time to Brasil tá muito bom. A Copa do Mundo de 2018 tá no papo! Brazi’s team is very good! The 2018 World Cup is in the bag! 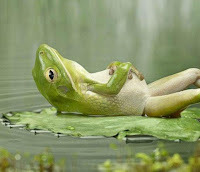 6. ficar/estar de papo para o ar = to do nothing. Fiquei o domingo passado de papo para o ar. I spent last Sunday doing nothing. Make up a sentence with one of the expressions above and write it in the comments!